Okay, I'll admit it, calling this an 'OOTD' is a bit of a porky pie.. This is more of a I-Wish-It-Was-An-Outfit-Of-The-Day, except that's a bit of a mouthful. I had planned on wearing this today, in fact for a few days I've wanted to, however the hideous English weather ruined my plans yet again! It's absolutely freeeeezing here at the moment (no snow where I am though, which is a disappointment! ), which is never a good temperature to look fashionable in. Anyway, moving on from my rambles and onto what I'm sure you much prefer to see/read. 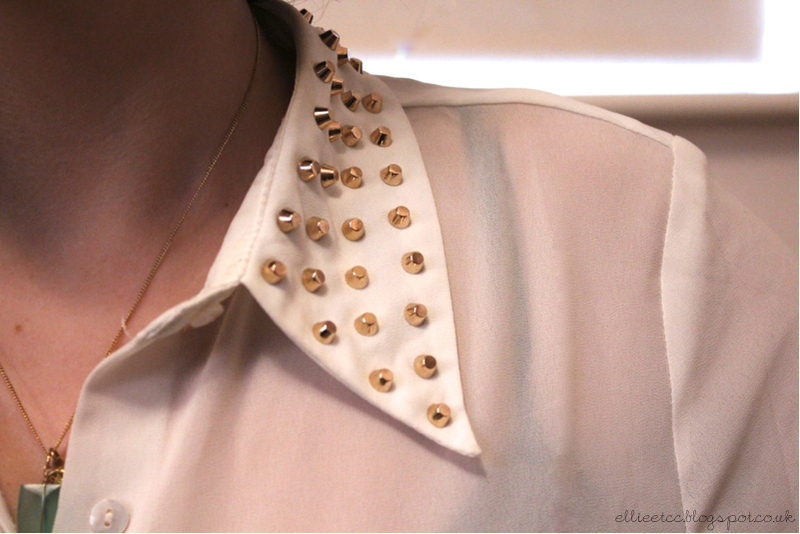 This outfit perfectly symbolises my deep love for studs. The studded trend seems to have been around for ages now, yet it still seems to be going strong - especially in my wardrobe. This skirt is a clear winner for me, it's featured on several OOTD posts I've done - it just somehow manages to go with everything?! As you can see one of my new studded clutches from my post here, has made it's debut in an OOTD post! I actually prefer the black version, and have used that version for several evenings out. So I thought I'd give the grey one a chance to shine, and I've got to say it's growing on me! The shirt was such a bargain, I absolutely love it - as I'm pretty sure I've said before! It's quite large though (I think it only came in 'One Size') but it makes it great to tuck into skirts, shorts or jeans. The trusty Topshop slipper-pumps have made a sneaky appearance again. Although they're starting to rub my little toes slightly, so I'm not sure how I'm going to be able to wear the beauties anymore! I'm often late at picking up on trends, so what do you think - is the stud trend is still going strong? Or do you think it's way past it's sell-by-date? Let me know by commenting below!